Look, we tried to keep Trump alive. Honest. 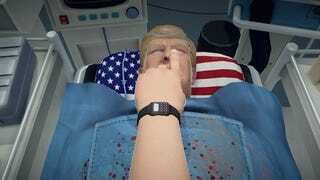 As you may have heard, Surgeon Simulator debuted an “Anniversary Edition” this week, and one of the new things this revamped version comes with is a mode that lets you cut open none other than the Republican presidential nominee, Donald Trump. Below, you can watch Gawker writers Marina Galperina, Ashley Feinberg, and Chris Person fumble around in Trump’s innards, all in the name of science. We never did complete the surgery, but hey. Messing around with Trump’s hair (which has its own physics) and his patented brand of steaks and vodka was still pretty damn fun. Make your choice in the heart transplant between a Heart of Gold or a Heart of Stone. The choice that players make will be recorded on the website to provide a live ‘vote’. New items have been added to the surgery: Trump Steak, Trump Vodka, Trump Tower. Make Up kit - Players can unlock a make-up kit by signing up to Club Bossa. Adept players can then decorate Trump’s beautiful features during surgery. Kotaku livestreams on Facebook every Monday / Wednesday / Friday at around 2PM EST. Next week, we’ll be checking in on Chaos Mario once more, along with a few other treats.